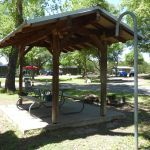 Ask fellow campers about "Blanco State Park" and nearby attractions. A smallish State Park compared to most. Very clean, but strangely situated as the southern border of the town of Blanco. Highway noise can be heard periodically, but not bad at all. Two loops and all appear to be level. Their shower house is impeccable. You are given a 4 digit code for the shower section of the restroom and they are immaculate! These are the best laid out, practical, and spotless showers I have ever seen!!! This in it self raises my rating of this park. Only a couple of OTA stations, but Verizon & ATT were both very usable. Would definitely stay here again. We camped at Blanco State Park in a Motorhome. Pleasant little park on the Blanco River. Full hookups available and enough room for bigger rigs. Our site was shady and clean. Spacing is close, but not crowded. Though right off a main US Hwy, the park is surprisingly quiet. Staff was friendly. Park is close to Austin, San Antonio, wineries, distilleries and good wildflower areas. We camped at Blanco State Park in a Motorhome. An outstanding bakery specializing in baked apple cake is located within walking distance. We have stayed at Blanco before, but in the summer. It's a nice park, but very small. It is also in a small town, and most things a person might want to do in the Hill Country during the winter will be a good 40+ minute drive. Essentially, not much to do at the park. However, the park itself is clean and nice. The sites are big and there are big, nice trees. There are two small playgrounds. Full hook-ups are available. They have covered picnic tables. We were glad we went, and we plan to return. Many reviewers complained about the road noise near the park. We hardly noticed it during the summer, but since we didn't have an a/c constantly running, we did hear a little more at night. It did not keep us up, however. The river was running much more briskly that during this summer with its drought. It was really beautiful. Fire wood for your campfire can be purchased for $5 from camp hosts; I believe the money goes to a non-profit that helps keep the park nice. Camp hosts were helpful and friendly. We enjoy this park and plan to return. We camped at Blanco State Park in a Travel Trailer. There is a laundromat just off 281 a few blocks north of the park on the right hand side of the road. We found it rather pricey, but we needed clean towels. The Lowe's grocery store is just to the south of the park on 281 on your left hand side. We visited a few times to get things. Try to arrive with most of what you will need. The Lowe's grocery store has higher prices, much like any small town grocery store. They also have a more limited selection, and understandably so. We camped at this park in late June of 2018. This is a small state park, but it has a lot. The river is clean and provides good swimming, kayaking/canoeing, and fishing. There are two small playgrounds. One has only swings, and the other has a slide and swings. Blanco SP has both partial and full hook-ups if you're camping. The full hook-ups (electric, water, and sewer) are on the inside of the loops; the partial hook ups (water and electric only) are on the outside of the loops. The sink and toilet areas of the bathroom were not clean, but they were small and were shared with day users. The shower areas of the bathrooms had an access code for campers' use only, and they were significantly cleaner. Park hosts and park rangers were friendly, helpful and active within the park. Park ranger at check-in helped us choose a good site on the map; park hosts drove around quite a bit, visited with guests, and really seemed to work hard at keeping the park safe, clean, and nice. Campsites were very clean. Most sites were spacious and shady. Much of the time, we didn't even need our awning. Most, if not all, campsites have covered picnic tables. I've read other campers' complaints of the park being too close to the highway and that they heard highway noise but I don't recall it being a problem. If we were on the river, we heard really big trucks when they drove over the bridge, but I don't recall hearing anything at night over the a/c. It certainly didn't keep us awake or keep us from enjoying the park. We enjoyed our stay here and we have already booked another stay here later this year. We camped at Blanco State Park in a Travel Trailer. With reservations made five months prior, we arrived on a Friday afternoon is a heavy rain storm for a two night stay in the full hook up campground. Check-in ranger gave us a choice of sites to choose from (unseen) and advised that they were HOLDING one for certain site for a 41 ft fifth wheel reservation. Ranger told us Site #9 was the best of the remaining available sites, but we could select any open site, except the one on HOLD for the fifth wheel, and then call back to the Headquarters. We opted to stay in Site #9 as it was the site with the least amount of standing rain water. Here's our Blanco State Park PROS and CONS: Pros - Beautiful site along the Blanco River River, swimming, Campground has large mature trees providing 75-80% shade cover, very level campsites, easy to walk to downtown Blanco and Catholic Church Campsite firewood for a donation of $5, wooden shelter over full hook up, campsite picnic table & close to camper full hook up outlets in good condition. Cons: Heavily used park and it shows it, Campground restrooms also used by day users, One shower for male and one for female for entire campground, Restrooms needs deep cleaning, full hook up sites lack privacy, sites close together, No night gate closure, Highway 281 traffic noise noticeable when outside only, Heavy rain caused standing water in many full hook up sites, Gravel/dirt/grass full hook up sites (very muddy after heavy rain), No boat/canoe/kayak rentals available (at least not in early May). Very popular State Park. Reservations for weekend stay is wise. We camped at Blanco State Park in a Travel Trailer. San Antonio about an hour drive away from State Park. Wimberley Market Days (first Saturday) is only 25 miles away from State Park. Limited retailers in Blanco; small grocery store in Blanco; prepare accordingly. A small State park just off Hwy. 281 in the town of Blanco, so there is some road noise, but not enough to bother us. Close proximity to shopping and restaurants. Good interior roads (chip seal) and mostly level, roomy sites. Some sites have covered picnic tables, and many have shade. Sites in full-hookup loop are arranged in a circle, like spokes of a wheel, with a large grassy area in the middle. Easy river access for fishing, etc. Nice road along the river to walk dogs. We would stay again if in the area. We camped at Blanco State Park in a Fifth Wheel. Nice park setting close on the Blanco river. Level back in with some shade. all utilities were good. Glad we had a reservation because it filled up on the weekend. Park police made regular rounds throughout the day. Bathrooms were well kept, but there are a lot of tent sites and on the weekend the restrooms were quite busy. We camped at Blanco State Park in a Fifth Wheel. Lots to do in Fredericksburg about a half hour away. On the way stop a Luckenbach for a cold beverage and free local music. Nice small park with a unique entry thru the river. Paved roads, sites are level and well spaced. Not much reception for OTA TV service. Trees needed to trimmed up to clear class A motorhome. Sits along the river but you can't see the water from the sites, just a short walk. Would stay here again. We camped at Blanco State Park in a Motorhome. Small park close to town. Trail from park connects right to the town square. Full hookup sites are in the center of the loop, so no scenic views. Beautiful river and dams but not seen from RV sites. Quiet park and felt safe. We camped at Blanco State Park in a Travel Trailer. Visit the town square for antique shops and eating. Bait is available to buy at park store and fishing rods,bobbers, sinkers loaned free by the park store. Serene and fun to fish on the river bank at dusk. The Ranger, when we checked in, was the most unfriendly person. Didn't smile the whole encounter. Most of the premium sites were taken by out of state "long timers". But we were able to get one of the few leftovers. Since Texas has a 14 day limit, I don't know how this comes to be. Our campsite must not have been policed for there was dog dirt all over it. Never saw a Park Host walk around. When I did need something, I walked over to their site and she was too busy talking on the phone. The Host's site was the messiest. Lots of junk. Lots of road noise and one man was power washing his rig. We won't be back. We camped at Blanco State Park in a Travel Trailer. Shop for groceries before you get here. This was our second time staying at this park. It's an interesting drive into the park, right across a small dam. They have full hookups available. Easy back-in sites with covered picnic tables. 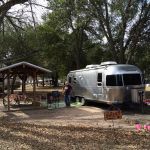 We camped at Blanco State Park in a Fifth Wheel. Whenever I am in the vicinity of this little jewel of a park, it is my primary camp of choice. The rangers and park hosts are professional, helpful and friendly. 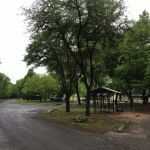 The park is well cared for and maintained and there numerous recreational activities within the park and in the Blanco, Texas area to choose from. We camped at Blanco State Park in a Truck Camper. Swim, float, paddle, canoe, wade, fish The Blanco River. Dine at one of several good eateries and shop within walking distance. Blanco State Park is a beautiful, small Texas State Park on the Blanco River in the Texas Hill Country. The river is cool and clear, excellent for swimming and floating. There are 31 RV sites, eight 50A with sewer, some 30A with sewer and some 30A & water. Park wifi was not available at our site. Excellent cell service with AT&T and Verizon. The river is a short walk from the camping area. Sites are all shaded. The grocery store is 1.5 miles from the park and restaurants 1/2 mile away. We have been here several times and will return. We camped in site 7 (premium site with 50A, water and sewer). We camped at Blanco State Park in a Fifth Wheel. Old 300 BBQ in town serves excellent brisket. Wimberley and Luckenbach are 30 minute beautiful drives. This park is on the edge of Blanco, and you can walk to the town square. 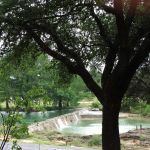 The park has the Blanco River running thru it, and it the CCC built a pool and several concrete dams so that people come here to lounge or swim in the water. The park is scenic, and is quite nice. The town has several decent cafes. We camped at Blanco State Park in a Motorhome. Blanco, TX - Blanco State Park. We spent a week in this park while we were getting work done on our Jeep in San Antonio. This park is in town so it's an easy walk to restaurants and convenience stores. Some sites are full hookup ups. Some are water and electric. As you exit the park there are some low hanging trees that made our exit a little difficult. Most sites were long enough to accommodate our 40 ft MH. We stayed in sites 19 and 30. Both were 30 amp and water but the weather was perfect and we had shade do didn't need more than the 30 amp electricity. Lots of space between sites and fairly level. It was extremely quiet except for the resident rooster that seemed to enjoy hanging around our bedroom window in the morning. We will definitely return to this park next time we are in the Hill Country area. We camped at Blanco State Park in a Motorhome. Are you affiliated with Blanco State Park ?